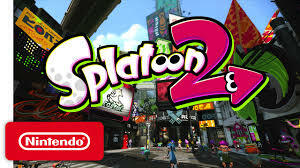 Splatoon 2 is a third person action shooter with a lot of charm and personality. I never had the opprotunity to play the first Splatoon but was always curious by it. I watched a few Twitch competitions and always liked the idea behind it. At the beginning of the month, I had the opprotunity to play the demo for this game and ended being pretty impressed with the little amount of time that the demo allowed. It drew me in with the colorful world, interesting characters, and pretty simple game mechanics. You start the game with the same tutorial that you would have gotten if you played the demo. I found this to be extremely important, especially since I never played the first one. The consept was simple; move from point to point while shooting different targets while the game teaches you how to effectively move around the area. I hated having to use the motion controls for this tutorial and just wished that they would give you the ability to change your controller layout. Upon finising the tutorial; you watch a video showing the world around you and the different characters that inhabit it. 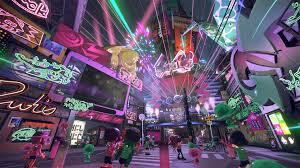 The world is called “Inkopolis”; basically your hub world where you are granted the ability to shop around and customize your character. Along the left side of the street are the various shops that sell particular goods. You can buy new hats, shoes, shirts, and weapons that each have their own standard enhancemets, as well as some hidden abilities that will reveal themsevels once you have earned some experience in multiplayer. To the right of the street, there is a large arcade which you can walk into allowing you to partner up with your friends and play online using the Nintendo Switch App…. Nintendo…What the heck were you thinking? This is by far the most rediculous work around for a chat system I have ever seen. Aside from the fact that I could only get it to work half of the time, the idea that you have to rely on your cell phone in order to do all the work just makes you seem lazy. It feels like they just simply forgot that gamers have been treated to a much simpler way of grouping up with some friends and chatting across networks. The technology has been around for decades, and yet it seems as though Nintendo has just now started to stubble upon servers and multiplayer gaming. If you get this app to actually work and if you are able to start chatting with you friends, your phone cannot run or be used for anything else other than this app. If you get a phone call from you partents or a loved one, basically kiss all your hard work good bye. If you close the app for any reason, the connection will be lost requiring you to relaunch, join a new group, and hope that missing some calls will not hinder your job or family. If you want to chat with your friends while playing this game, there are easier alternatives than this system. I prefer using skype. Though there is a bit of a delay, its still better than having your phone die after attempting to use this system for a couple of hours. I know there are probably a number of reasons why they decided to do this. I’m sure that they are not in the market to piss off their fan base. Nintendo…try harder. At the end of the plaza is a large stage with an elevator like door that leads you to the online match making area and in the back corner of the plaza, there is an area where you can play a game called Salmon Run. This is wave based mini game where you fight hordes of fish like creatures and bosses in order to collect eggs for a mysterious benefactor in exchange for rare loot and hidden prizes. More on this later. When you are ready to start moving around, you will notice a woman where jumps down into a drain. By following her down the hole, you will be able to start the six hour story mode. Like most games, the first thing that I try out is the Story mode. I want to become invested in the world around me and get to know the characters that I will be playing with. The story involves your character becoming a recruit in a shadow organization that maintains peace throughout the world. You find out that giant “Zap Fish” has been stolen and its up to you to get it back. The fact that they would intrust such a difficult task to a fresh recruit speaks volumes to the leadership of this organization…but I digress. The story is broken up into multiple areas that are inhabited by multiple stages. Each stage can only be opened once you have located it within the area. They will need to be tracked down and then shot with your weapon in order for you to enter. The stages are not very difficult and are at times will hold your hand through most of it. I saw these stages are more or a less an area in which you can try out new weapons and try out new techniques that could make you that much better when you get into the multiplayer aspect of the game. At the end of each stage, you will need to free a smaller Zap Fish in order to move on. Collecting a certain number of Zap Fishes will open up the boss stage and the real challenge will begin. The boss stages were by far the best part of the story modes. Each one of the bosses had their own personality and art design that truley made them pop. They ranged from the wacky to down right creepy and each one were not to be taken lightly. Most of the matches involved me running around and trying to figure out exactly what it is that I needed to do. Eventually, through trial and error, I was able to figure it out and take down my opponent. The overall story mode is not overly long, but it is pretty fun and a good way to hone your skills. The story is said to take a minimum of six hours to complete and is full of hidden secrets and items that can be found by those who have a sharp sense of situational awareness. Nintendo once again decided that they would change up everything that we are used to when it comes to online game play. When you first connect to the internet, you will be forced to sit through an opening news cast which introduces you to the available maps and the differnt modes. Yes…thats right…you can’t play all the maps. 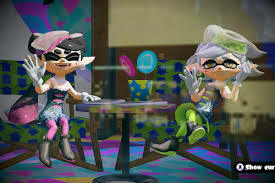 Nintendo decided that it would be a great idea to only offer certain maps at different points thoughout the day and that the maps would rotait. Because of this, periodically while you are playing, you will recieve a message that the stages have been changed and you will have to go back to the main screen and rejoin your game. Again…I am sure there is a rational reason behind this, though I am not seeing it. Before you start a match, you will have the ability to change out your clothing that you purchased, or try out some new weapons. Since the games launch, finding matches have been pretty smooth and the wait time has been drastically reduced. During the demo, I spent a total of five minutes waiting for just one more person to join the lobby. Because there is no way of backing out of the match maker once it starts, you are left with two choices; you can either set your system down and catch up on some houshold activities, or you can close the game and relaunch. There is a count down timer that will send you back to the start once the time runs out, however, if someone turns off the system or if just one person joins, the timer will reset. I am hoping that Nintendo will see that this is an issue and will try to correct the problem. A simple “back out” option would be great. 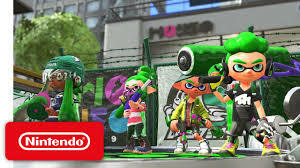 As of right now, the only game that is availiable for normal multiplayer is a game called Turf War. This has a very simple premise in which you attmept to paint the most territory with your weapons then the opponent. Its a nice change of pace from the typical “the most kills win” and instead relies on your ability to understand your opponents patters and attempt to out flank them. You are given three minutes to take over as much territoy as you can get. I found that during the last minute of the game, everyone is just frantically coving as much ground as possible and are not too worried with killing someone that has been targeting them throughout the match. Different weapons will give you certain advantages and disadvantages that will either help you or hinder dependening on the players you are against. Most of the weapons are typical gun variations like sniper rifles, assualt rifles, and pistols. While others are a little more comical in nature. 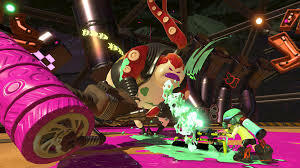 You can use a giant paint roller that will paint a large surface area and kill enemies with a simple touch, but will use up a lot of your ink and will cause you to move pretty slow. There is also giant paint bushes, buckets of paint, and my favorite, the original VR pistol from Duck Hunt. I was literally beaming from ear to ear when I found out that this was an actual weapon that you can use. With the lobbies filling pretty quickly and the matches not being to long, it was easy for me to drain a few hours into the multiplayer in an attempt to level up and have the opprotunity to buy new gear for the multiplayer. Its a vicious circle that I am ok with. 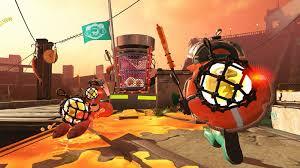 The most addicting part of this game is their wave based mini game “Salmon Run”. You notice a shack in the back corner of the hub world and take a look inside. Once you are at least level 4, you will be able to speak to a faceless benefactor who offers you a proposition. He wants you to collect golden eggs for him and in return, he will give you prizes and treasure. Seems simple. You will be partnered up with three other random people and will be sent to a platform in the middle of the ocean. You have to survive three waves of rampaging fish while defeating various boss fish in order to obtain thier golden eggs. In order to progress through all of the stages, you will need to collect a certain number of eggs. Playing the first few matches are pretty easy and they are designed to help you get a handle on he situation. After you have earned your first couple of rewards and are have leveled up, the real challenge will begin. Sometimes the water level will rise and you will have less area to run or re-group. Other times, special and more tough enemeies will appear and quick reaction timing with relyable teammates will be the difference between life and death. Each battle felt like something new and not one match would end the way I thought it would. You deffinatley felt like you earned the win when you won and felt the sting when you lost. Only issue I have with this is that Nintendo once again decieded to change things up. 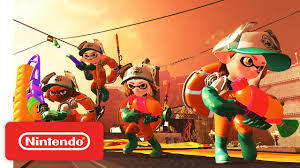 Nintendo decided that this mode would not be avilable all the time, and instead wanted it only playable on certain days and at certain times. This is extremely frustrating and it makes me want to find the person that is coming up with all of these dumb ideas. I truly love what they did with this game. The environment, characters, and enemies is just the type of wacky that all lovers of Nintendo have come to expect. The story is not overly long, but thats ok. It gives you just enough training for online gameplay and it gives you a sense ounderstanding when it comes to the characters and events around you. The online game play is fresh and new to anyone that has just been playing the typical first person shooters and it lets you just have fun. 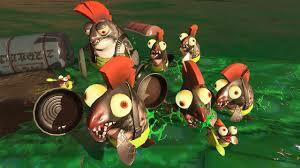 The Salmon Run is by far my favorite aspect of this game, which all the more sucky that it can only be played during certain days and times. They have some areas to fix, especially when it comes to the Nintendo Switch app and online availiablity, however, I have enjoyed my time with this game and hope that you will too. I agree! The game seems like such a simple concept yet the overall competition will just flip on a dime. I’m glad that you liked it! I just started playing Splatoon 2 last night (having never played the original) and I’m really digging it. The single player is kind of boring tbh, so I just jumped right into online. I love the frenetic pace of the action and the lighthearted premise – music is great too! Yeah the main story is pretty lacking. Then again, I really don’t know what they could have done with a premise like this. I just played it in order to try out the different weapons. So far so good, I haven’t tried Salmon Run yet, gotta give that a go! You will get addicted. It’s hands down my favorite part of the game. Previous Post Discussion: How Would You Survive?